We are an American builder of high quality, yet affordable custom furniture. You choose the fabric and the style. Customize it! Make dimension changes to our styles without it costing you an arm and a leg! Once we build your furniture, we wrap it securely and send it to you via an in-home delivery carrier. Because we are the manufacturer, we can easily modify and make customizations to our dimensions - at a low cost to you! Customization requests are handled on an individual basis. Once we understand your preferences and specifications, we'll offer you a price quote. Browse our website. Look at our styles and our standard dimensions. Want to make a change? Ask us! It's no big deal. Add nailhead trim. Add contrast piping or welts. Add an arm to any of our 1-arm sectional components. Add a skirt if there is no skirt. Remove the skirt if you don't want it! Change the feet. Make the arm higher or lower. Make the arm wider. Add length. Add seat depth. Increase the overall height. Have another style in mind that you don't see on our website? Send us a link to it! E-mail us at info@carolinachair.com or use the contact us form. Tell us what you like about the style. We will get back to you quickly. We promise! Get some ideas by looking at what others have created on our custom inspirations page in our photo gallery. We want to hear from you! No excuses. Where else can you design your own furniture at affordable prices? And keep in mind, in terms of quality, we can't be beat. We are eight-way, hand tied seating with all hard wood frames. We are top-of-the-line custom construction. We offer a wide selection of fabrics including chenille, twill, denim, microdenier, microfibre, microfibre, suede and Sunbrella® canvas fabrics! Microfibre and suede fabrics are very popular because they are heavy duty (commercial grade) - yet very soft to the touch - and they are very easy to clean!. Sunbrella is a trusted name in dependable, functional, and colorfast fabrics. We offer a variety of Sunbrella canvas fabrics. All offer the benefits of feeling soft and comfortable, easy to clean and being fade proof! Furniture orders using special request Sunbrella fabrics are considered custom. Note: we can purchase most Sunbrella fabrics, however, we cannot provide swatches of Sunbrella fabric not on our website. If you find a Sunbrella fabric that you like, let us know the name and/or number and we check on availability of that fabric and will offer you a quote for your furniture in that particular Sunbrella fabric (if available). Our partnership program with Barrow Industries, a fabric distributor, offers our customers over 7500 fabrics from which to choose. Barrow Industries is a leading fabric supplier to many high-end design centers around the United States.We are constantly looking for ways to improve your furniture buying experience and we believe that this program complements our current line of regular fabrics and offers you the opportunity to find a fabric that is exactly what you want! You may search Barrow's fabric website by color, pattern, and product line. Once you find the fabrics you like, write them down and fill out the Special Request Fabric Quote Form. If you would like to order swatches, mark the Order Swatch box on the form. You may also order Special Request fabric swatches by calling us at 1-800-653-9757. Special Request Fabric swatches are $3.00 each. 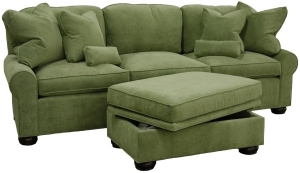 When you order furniture using a Special Request Fabric, we will reimburse you up to $30.00 or 10 swatches. If you would like a price quote for specific furniture pieces, please let us know what furniture pieces you want by selecting them in the drop down menu on the quote form. A bit of information for when you're browsing the Special Request Fabric selection: don't let the "retail price" on the fabrics scare you! We do not pay the retail price for the fabric, and therefore, you won't either! Give us a try and you'll be pleasantly surprised with our price quote! 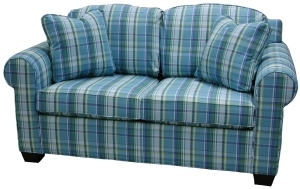 Our furniture prices using Special Request Fabric are usually less than 10% higher than our regular fabrics! When you decide to order furniture using a special request fabric, we'll take care of everything - from deciding how much yardage is needed, to ordering and inspecting the fabric! It's just like you are buying from a fabric store or design center - except we take care of everything! If you're interested in ordering fabric only, you can purchase it from us at incredible savings! Call us at 800-653-9757 and we'll give you the price! Our COM (customer's own material, customers own material) program is very popular and this option has worked well for our customers! Here's how it works: You find a fabric at a local fabric store (or online), buy it, and ship it to us to use in the manufacturing process. We will offer you a quote for manufacturing your furniture in your fabric! We'll also tell you how many yards of fabric to buy for the furniture pieces you want. If you're considering using our COM program, please call us at 1-800-653-9757 for details such as fabric yardage and information that needs to be included with your fabric shipment. Carolina Chair, Inc. does not assume responsibility for lost fabric and does not offer any warranty explicit or implied for customer's own material, customers own material (there is no fabric warranty with COM orders). COM orders may not be cancelled once the fabric has been cut. If you email us and do not hear from us, please check your SPAM folder. Our response to you may end up in that folder!